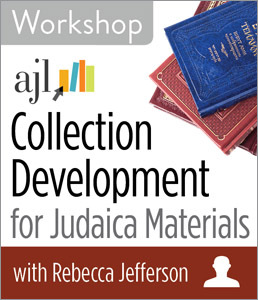 CHICAGO—ALA Publishing eLearning Solutions announces an exciting new workshop, Collection Development for Judaica Materials with Rebecca Jefferson. This workshop will last 90 minutes and take place at 2:30pm Eastern/1:30 Central/12:30 Mountain/11:30am Pacific on Thursday, Dec. 14, 2017. This workshop is a collaboration between ALA Publishing eLearning Solutions and the Association of Jewish Libraries (AJL). This workshop addresses the needs of non-specialist librarians who wish to build or enhance their library’s Judaica holdings or for anyone interested in building a collection of Judaic materials. The session includes an overview of the different types of Judaica libraries and collections (who collects what and why), as well as an overview of notable vendors of Judaic resources and bibliographic resources. This will be followed by step-by-step guidance on collection building, which will take into account traditional collection development techniques, such as environmental scanning, patron needs assessments, and institutional mission alignment, together with other considerations such as library funding. The workshop will also cover just-in-time purchasing for access to core resources versus just-in-case purchasing designed to augment, preserve, and provide access to limited resources. Rebecca Jefferson is the head of the Isser and Rae Price Library of Judaica at the University of Florida, where she is in charge of collection management and development. Her Ph.D. in medieval Hebrew is from King’s College, University of Cambridge. She previously worked with the famous Cairo Genizah manuscript collection, serving as its bibliographer for 12 years. Her published research focuses on the history of this collection. Jefferson is currently the principal investigator, together with Dean Judith Russell, on a National Endowment for the Humanities Challenge Grant to protect, preserve, and promote hidden or endangered Jewish community materials from Florida, Latin America, and the Caribbean. She also serves as the president of the Research Libraries, Archives and Special Collections Division of the Association of Jewish Libraries.